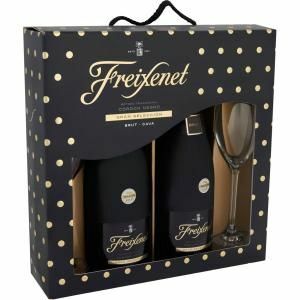 SPARKLING WHITE WINE - BRUT - SPAIN - WITH 2 FREIXENET GLASSES ! One of the world's most famous sparkling wines, this is the benchmark against which all Cava is judged. Extremely fresh with a good balance of fruit, displaying the classic characteristics of its traditional grape varieties.